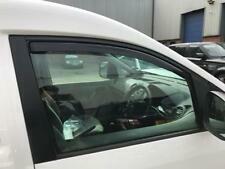 For VW T5 T5.1 T6 Wind Deflector 2003 Onwards. They not only look great fitted to the T5 but also reduce wind noise and rain from entering the vehicle if you have it open slightly. In Channel Type. Great Quality & Design. All Years 2004 - 2017. For VW Caddy Wind Deflectors Perfect Fit. They not only look great fitted to the Caddy but also reduce wind noise and rain from entering the vehicle if you have it open slightly. 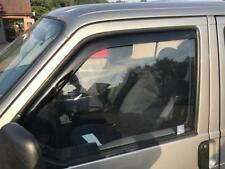 D004 FORD RANGER T6 2012 ON DOUBLE CAB WIND DEFLECTORS - 4PCS. When in place press down along the surface of the deflector to hold it in place. Our STX deflectors are designed to maximize and improve comfort and protection when driving in any weather condition. The Heko Wind Deflector is designed to allow you to keep your windows open while protecting you from the wind, rain and the glare of the sun. They allow natural air flow into your car without wind buffeting or noise, improving the overall comfort of driving. Super high qualityWind and Rain Deflectors to suitVW Volkswagen Crafter (2017 - present models). Mounting is done by using heavy duty adhesive 3M tape (supplied). This is why adhesive fit deflectors are preferred. Super high qualityWind and Rain Deflectors to suit Iveco Daily (2011 - 2014 models). Their smoke (tinted) finish and stylish design greatly enhance the look of your vehicle as well as being very practical as they reduce noise and reduce wind turbulence (thus increasing fuel efficiency). New front and rear wind/rain deflectors for VW Golf Mk6 2008-2014. Turborevs window deflectors add style and particality by allowing heat to escape, reducing wind noise and allowing fresh air into the vehicle. Will fit all models of VW T4 Transporter / Caravelle. VW T4 Wind Deflectors. They not only look great fitted to the T4 but also reduce wind noise and rain from entering the vehicle if you have it open slightly. 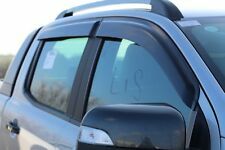 Front & Rear Wind Deflectors (4pc). Each wind deflector is precision cut from 3mm tinted acrylic to the exact fit of your Ford Fiesta. Its dark tint and aerodynamic profile gives these wind deflectors a sleek look, enhancing your cars appearance. 4PCS WIND RAIN DEFLECTORS WINDOW SHEILD FOR FORD FIESTA 2008-2017 (5D MODELS). New front and rear wind/rain deflectors (4 PIECE KIT) for FORD FIESTA MODELS (5 DOOR HATCHBACK MODELS ONLY) 2008-2017. FA026 DEFLECTORS. 4PCS WIND RAIN DEFLECTORS WINDOW SHEILD FOR LAND ROVER FREELANDER. New front and rear wind/rain deflectors (4 PIECE KIT) for Land Rover Freelander 1998-2005. FA026 DEFLECTORS. Turborevs window deflectors add style and particality by allowing heat to escape, reducing wind noise and allowing fresh air into the vehicle. Genuine Climair Front Wind Deflectors - Toyota Proace 2016>. Toyota Proace & Proace Verso 2016>. Each wind deflector is precision made to fit a specific vehicle and are installed quickly into the window channel. Ford Ranger T6 wind deflectors are designed to allow you to keep your window open slightly and not have rain drip into your cab and the wind deflectors will also reduce wind noise when you have your windows open. Super high qualityWind and Rain Deflectors to suitVolkswagen Caddy / Caddy Maxi (2015 - present model). Mounting is done by using heavy duty adhesive 3M tape (supplied). This is why adhesive fit deflectors are preferred. 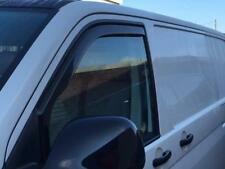 VW T5 Bonnet & Wind Deflector's Great Quality. Fits All T5's 2010 - 2015. They not only look great fitted to the T5 but also reduce wind noise and rain from entering the vehicle if you have it open slightly. MITSUBISHI SHOGUN 2000-2014 EGR QUAD DEFLECTORS - EXTERNAL FIT. Compatible for – Mitsubishi Shogun 2000-2014 (4 Door). Our EGR deflectors are designed to maximize and improve comfort and protection when driving in any weather condition. 1982 - 1995 Holden Drover SJ30 / SJ40 / JA11 / JA51 / JA71 / JB31. 1982 - 1995 Suzuki Jimny SJ30 / SJ40 / JA11 / JA51 / JA71 / JB31. 1982 - 1995 Suzuki SJ410 / SJ413 SJ30 / SJ40 / JA11 / JA51 / JA71 / JB31. 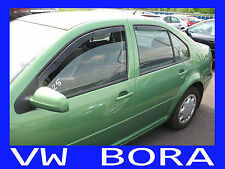 New front and rear wind/rain deflectors (4 PIECE KIT) for VW Golf Mk5 2004-2009. Turborevs window deflectors add style and practicality by allowing heat to escape, reducing wind noise and allowing fresh air into the vehicle. Turborevs window deflectors add style and practicality by allowing heat to escape, reducing wind noise and allowing fresh air into the vehicle. 2 x Front window deflectors. New front and rear (4 PIECE SET) wind/rain deflectors for FORD FIESTA 5-DOOR MODELS 2008-2016. Turborevs window deflectors add style and practicality by allowing heat to escape, reducing wind noise and allowing fresh air into the vehicle. 1992 - 1995 Toyota Corolla AE100 / AE101 / AE102 / AE104 / CE100 / CE104 / EE101 Sedan. - Enable smooth air flow to prevent mist and fog on the windscreen and hence, gets better and clearer vision while driving. Genuine Climair Front Wind Deflectors - Peugeot Expert 2016>. Each wind deflector is precision made to fit a specific vehicle and are installed quickly into the window channel. 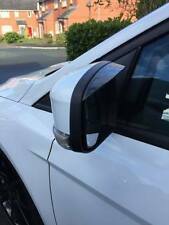 2x Genuine Climair Front Window Deflector. New front and rear wind/rain deflectors (4 PIECE KIT) for BMW 5 Series E60 2004-2009 4D SALOON. Turborevs window deflectors add style and particality by allowing heat to escape, reducing wind noise and allowing fresh air into the vehicle. New front and rear (4 PIECE SET) wind/rain deflectors for BMW 5 SERIES E60 (4D SALOON) 2004-2009. Turborevs window deflectors add style and practicality by allowing heat to escape, reducing wind noise and allowing fresh air into the vehicle. New front and rear (2 PIECE SET) wind/rain deflectors for VAUXHALL VIVARO 2001-2014. Turborevs window deflectors add style and practicality by allowing heat to escape, reducing wind noise and allowing fresh air into the vehicle. Super high quality wind and rain deflectors to suitCitroen Berlingo (2016 - 2019 models). Their smoke (tinted) finish and stylish design greatly enhance the look of your vehicle as well as being very practical as they reduce noise and reduce wind turbulence (thus increasing fuel efficiency). Super high quality wind and rain deflectors to suitCitroen Berlingo (2008 - present models). Their smoke (tinted) finish and stylish design greatly enhance the look of your vehicle as well as being very practical as they reduce noise and reduce wind turbulence (thus increasing fuel efficiency). Their smoke (tinted) finish and stylish design greatly enhance the look of your vehicle as well as being very practical as they reduce noise and reduce wind turbulence (thus increasing fuel efficiency). Very light weight -Installation requires special experience.-To install, use double sided tape! - Made of Fibreglass. -Window Wind - Rain Deflectors for Toyota Celica ST182, ST183, ST185, CS, RC. Rear roof Spoiler from Fiberglass for TOYOTA Celica AT200 ST202, ST205 GT4. Super high qualityWind and Rain Deflectors to suitVolkswagen Transporter T5 / Caravelle (2004 - 2015 model). Mounting is done by using heavy duty adhesive 3M tape (supplied). This is why adhesive fit deflectors are preferred. FA026 DEFLECTORS. Turborevs window deflectors add style and particality by allowing heat to escape, reducing wind noise and allowing fresh air into the vehicle. 2 x Front window deflectors. Turborevs Ltd was established in 2006 out of our passion for modified cars. To Fit Model : LANCER / MIRAGE / CK2. Remark : DOOR VISOR RAIN GUARD. To Fit Make : MITSUBISHI. Item fit on a modle car in picture only. Quantity : Price for a set of 4. Interchange Part Number : T2P-0447-MIT001. Vauxhall Astra (J) Estate 2010 - 2015 (5 Door) Farad Wind Deflectors - 2 Piece Set. Slim design and tailored fit for your Vauxhall Astra. Vehicle:Vauxhall Astra (J) Estate 2010 - 2015. Wind Deflectors designed to fit. 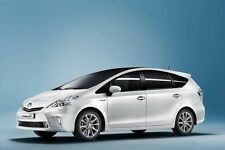 To Fit Model : YARIS / VIOS / SEDAN. Remark : DOOR VISOR RAIN GUARD. To Fit Make : TOYOTA. Item fit on a modle car in picture only. Quantity : Price for a set of 4. Interchange Part Number : T2P-2054-TOY043.